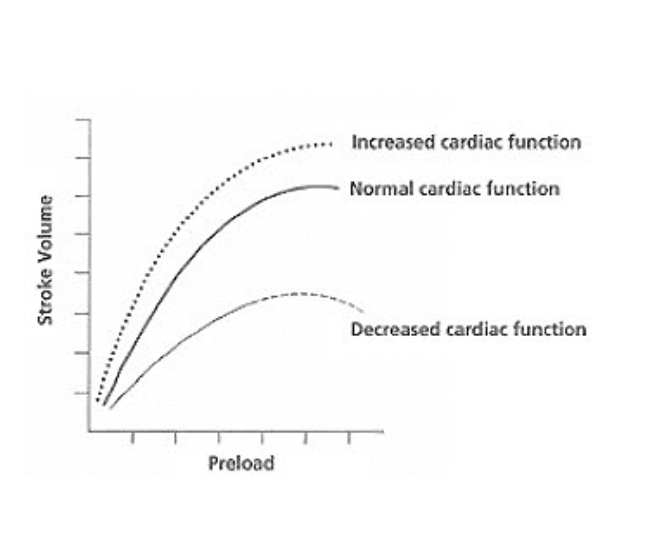 In patients with shock, there is tissue hypoperfusion and decreased cardiac output. Fluid administration can be beneficial if it increases stroke volume, and therefore, cardiac output. Increased stroke volume leads to increased end-diastolic volume and mean circulating filling pressure, thereby increasing preload and causing volume expansion. The goal in shock is to steer patients onto the ascending limb of the Frank Starling curve. When fluid administration does not increase stroke volume, there are potential harms. Excess fluid administration can lead to tissue edema and ultimately, tissue hypoxia and organ dysfunction. Many septic patients have preceding heart failure, about 54% with diastolic dysfunction and 23% with systolic dysfunction, which can be worsened by fluid administration (Landesberg 2012). Over-stretching of the left ventricle (LV) causes impaired LV dilation, leading to pulmonary edema, pulmonary hypertension, and right ventricular dysfunction. In fact, diastolic dysfunction was associated with worse outcomes than systolic dysfunction (Landesberg 2012). A fluid challenge is necessary to determine whether fluid administration will benefit a patient. A patient is considered to be fluid responsive if their stroke volume increases by at least 10% after fluid administration (usually 500cc of crystalloids) given as quickly as possible (typically over 10 minutes). Patients who have decreased systolic or diastolic function (on the descending limb of the Frank Starling curve) will not respond to a fluid challenge, even if they are intravascularly depleted. Clinical signs can indicate tissue hypoperfusion, but not fluid responsiveness. Traditional indicators, such as CVP monitoring and mean arterial pressures (MAP), are not accurate enough. Ultrasound is a potential new tool that can be used to assess volume status and fluid responsiveness. For volume status, there have been studies looking at IVC caliber in ventilated patients, but this has yet to be validated in spontaneously breathing patients. Lee presented an evidence-informed algorithm based on the available literature to guide fluid resuscitation decisions (Lee 2016). For fluid responsiveness, transthoracic measurements of LV outflow tract velocities for the estimation of stroke volume require considerable expertise and not easily or rapidly obtainable. Marik suggests alternative methods, such as pulse pressure change measured by radial a-line, LVOT velocity time integral (VTI) on echo, carotid Doppler flow on transesophageal echo, pulse contour analysis, thoracic bioimpedance, bioreactance, etc may be better indicators of fluid responsiveness (Marik 2013). Passive leg raise (PLR) and fluid challenge are two ways to determine fluid responsiveness, especially when used with real-time cardiac output monitors. PLR causes a shift in venous blood from the lower extremities to the thoracic compartment; it is essentially an auto-fluid bolus. “…in almost half of the patients no hemodynamic variable was used to predict fluid responsiveness – and if used, CVP was used most often.” (Cecconi 2015). Only about 50% of hemodynamically unstable patients are fluid responsive, and only about 50% of those patients are tested for fluid responsiveness; this is a major aspect of emergency and critical care medicine that we can focus on improving. I agree with this article. I definantly agree that fluid resuscitation is nessissary however you do have to make sure the patient can handle it prior to administration. I also like the way you used PLR.